26 February 2012. Under scorching heat with rain for the last part. 200+km of pain and suffering. Organized by NTU sports club, it is not professionally organized compared to other big-timer events such as OCBC cycle Singapore or the Cyclone Race Series, instead it is organized by students from NTU and I must say that they have done a pretty well done job this time round. The route comes in the form of either 168km for the faster participants or 128km for the more physically challenged participants. Owning to school and other commitments, I forgot/did not manage to sign up for the event. Approximately 1 month to closure, I managed to remember to sign up. To my dismay, registration has already closed. So I did not manage to make it in time for the ride start point at F1 pit building. Rather, I chose to “crash” the event by joining them at West Coast Park after joining my weekly Joyriders ride which starts from Longhouse. Started the ride with about 60km of warm up done and met with some of my rider friends at West Coast Park. One of the event rule is that you must not overtake the lead car at all times. So I waited for the lead car to move off again and when it went it has a huge group of cyclists drafting it, leading to the rest of the people not drafting it and riding at their own pace. The lead car does a pretty leisurely speed of 35-40 and while it is good for the drafting cyclists behind it, it is not so good if you miss out the draft and have to find your own peleton/group to ride with. Went on a pretty steady pace all the way at about 38-39kph for the first 60-80km or so finding cyclists to draft behind me or switch places.Managed to find a group with about 7-8 riders with 2 riders on TT bikes and pulled for them. Was quite surprised to find them drafting behind me while using aerobars! While I do not condone the action, I find it a little disturbing as it compromises their bike handling abilities.Met up with them on and off a few times during the course of the event as well. 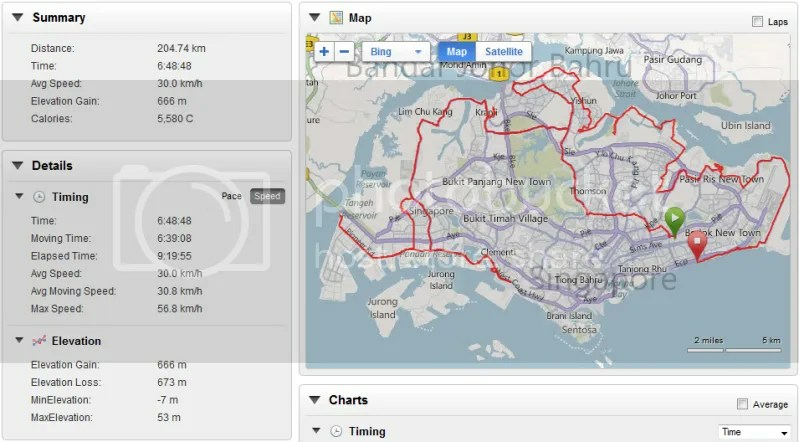 The ride was very pleasant overall which is rather flat and covers most of the popular cycling routes in Singapore such as Lim Chu Kang Road,Changi Coast Road as well as parks such as Woodlands Waterfront, the newly built Punggol Promenade and through the CBD as well.Marshalls were on hand to block traffic flow though i did not see them after 100-120 km or so. Well, I think its because its some people experiencing their first long distance event. For the first 40km or so, they were zigzagging between riders not caring about their safety and other people safety also. A nuisance and hazard to both traffic and themselves.Some ran past red lights not giving a flying f*@k about other motorists in the way. I mean it is not a competition, so I wonder at the thought of people running thru lights. Also many people were doing the ride solo without any assisted form of drafting or whatsoever. I respect their decision as its like almost doing an Individual time trial for like 168/128km. While partially my fault, i had pretty long breaks due to my friends resting too much and IMO, should not have done that. Resting at stops frequently and for long periods of time have sapped not only my momentum, but also my strength as the sun gets hotter and hotter.I was shagged and tired when i hit the 200km mark though i feel i could done more if I had not stopped frequently.The lead car also has pretty long breaks in between the checkpoints and I feel that it breaks up the momentum gained from riding. Though not professionally organized,NTU bike rally has been a pleasing and relaxing ride. Though I feel that something can be further improved.Nonetheless a well done for the student organizers. I will remember to join it officially next year! Lastly a summary of my ride stats for the event. Somehow managed to get my picture taken! All the sweat dirt on my face with my friend Nicholas! This entry was posted in Race/Ride Report and tagged aerobars, Bike Rally, Bike Rally2012, pain and suffering, steady pace. Bookmark the permalink. Enjoyed reading the post; I guess the NTU Bike Rally isn’t really meant for riders like you, who can complete 200km in one morning. Riding further at the back, I saw newbie roadies and they were discovering the joy and pain of the distance! Many of those made 148km (i.e. they made the first cut-off but not the second). You’re right about the unsafe, wild overtaking at the front by inexperienced riders; that’s been a problem every year; tough problem to solve. I look forward to the rally every year, I use it to restart my ride every year! Keep up your writing, its great to see your blog posts. I have been participating in it since 2009, So i guess its sort of an annual event for me. To me in a long distance ride, as long as the peleton or the group works together, it is possible to complete long distance in a rather short amount of time. Thats where most amateur Singaporeans riders do not have experience due to either bad experience in drafting or mainly distrust of other riders. As long as safety and common sense is first practiced by us riders, I am sure the roads will become safer and in turn drivers will respect cyclists. I’ve been participating since 2003 – but am usually far behind on my mountain bike complete with knobblies! But have enjoyed a faster ride at the beginnings and appreciate the pleasure of a steady peloton. Next year we’ll try to be fast enough make the second mark. Maybe in a few years will try making the cut off times on a foldable bike – have to keep pressure off my injured knees so am preferring my mountain bike for now! You might go faster on a roadbike, maybe might even do the 168km comfortably! Ever considered 1? Dont perceive all road bike as race-oriented geometry there are those with more upright position such as that of my trek 1000.As for knee pain,Cleats with floats(like Look Keo grey cleats) can let your knee have some form of side movement so that your knees wont be “locked” in position.